Night 3 of week 4 and Rachel is poised to take the week in our charity challenge – I’m going to try my best to shut her down. If you’d like to donate to our campaign please visit our donation page! 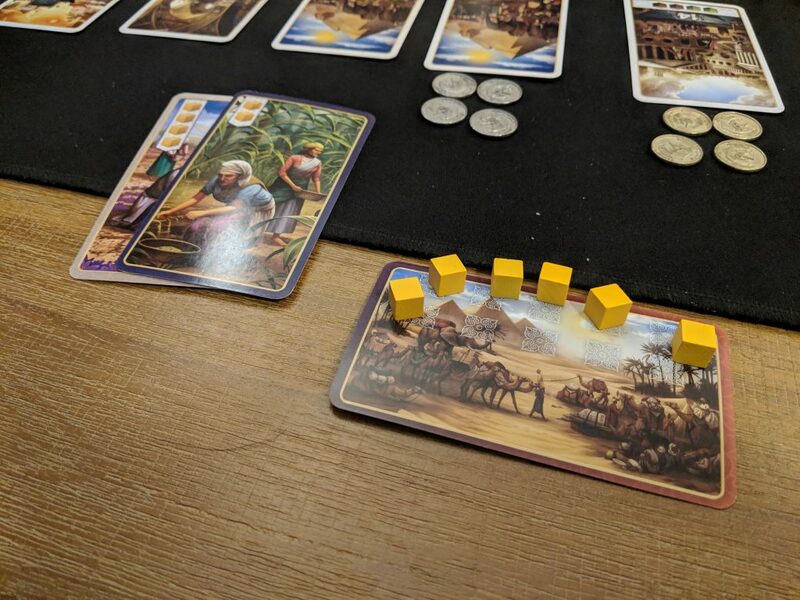 Since I need to stop Rachel’s clean sweep of week 4 tonight I have to bring in one of my couples games big guns: Century Spice Road. We have played Century 8 times, Rachel has won 0 of those times. I need a win guys! 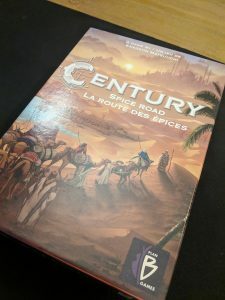 Century is a game we played last year and is a card based engine builder for 2 to 4 players. Every turn players can do one of four things: Play a card and do what it says, or claim a new card from the board, or claim an objective card or take back all the cards you’ve played into your hand. The goal of the game is to collect spices and trade those spices for objectives. The cards let you either acquire new spices or trade up or down your quality of spices with varying efficiencies. 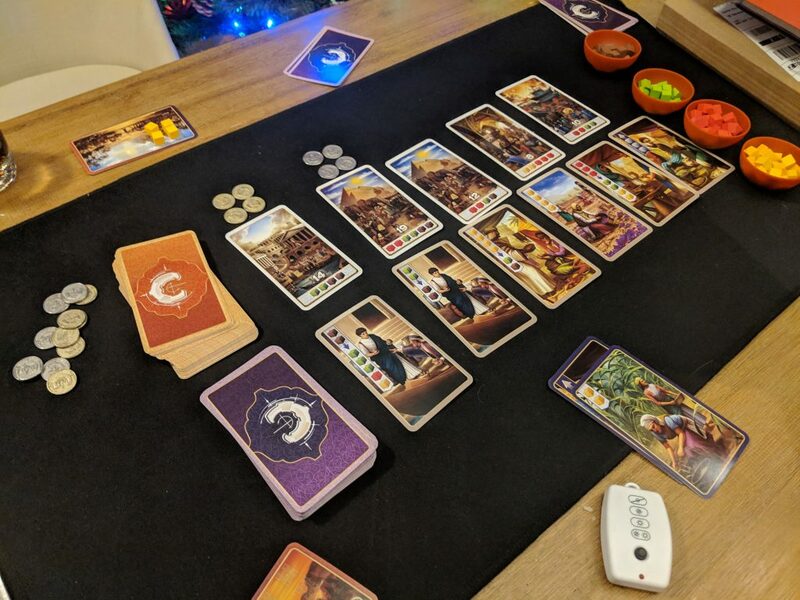 The game is a balance of building up a hand of cards that combo together to get you resources efficiently versus using those cards to actually get you things (since you can only do one of play or acquire cards each turn). It’s a bit of a race as the game ends as soon as a player acquires their sixth objective card. I was thrilled with my start in this game. There are some cards that are better than others and in my first three turns I thought I had snagged what were the best cards, cards that created large amount of spices for me. What I didn’t notice was Rachel was grabbing all the cards that very efficiently traded up to higher level spices, higher level spices can claim higher level objective cards. So the result was she was claiming bigger objectives, so the only way my engine was going to win was if I sped it up. The race was on. The final score was 84-70 for me. A personal best score for both of us – I think we’ll be seeing Rachel’s first win real soon. And so it came to be. Whilst I thought I was just killing it working towards ending the game as fast as possible Rachel’s silky smooth engine just rolled right over me. In the end Rachel set a new personal best of 95 to my 75. This year’s competition has been one of upsets. Trump games, games that according to the record book should be a walk in the park have just thrown up so many surprise results for both of us. With this win Rachel has officially won week 4 meaning that for the first time in this competition’s history we are going into a competitive week 5 for the whole competition. We’ll be jockeying with our game choices over the next 2 game nights to finish out this week and set us up for next week when it all goes down.